Kopparkitteln, The Copper Kettle, is a family-owned restaurant in the heart of the oldest town in Sweden. Kopparkitteln, The Copper Kettle, is a family-owned restaurant in the heart of the oldest town in Sweden. With watchwords such as quality, hospitality and tradition we offer our guests an extraordinary food and beverage experience in a fusion of Swedish gastronomy and classical cookery from the Mediterranean. Our primary goal is to make our guests satisfied in all aspects of the meal. The beautiful view over lake Mälaren and our genuin hospitality makes Kopparkitteln a natural place to visit during a day-tour to Sigtuna. Welcome to Kopparkitteln in Sigtuna! Lettuce with tomatoes, cucumber, sheep’s cheese and red peppers topped with red onionrings, kalamataolives och the vinaigrette of the house. Served with roasted bread and butter. During our summer months (May – Aug) our wine bar is open in connection to the restaurant, where we offer our guests different wines from different regions and varieties combined with snacks and tapas. The cellar of the old building has now been converted into a private facility where we tailor our guests conferences, wedding receptions, birthdays or just a pleasant evening with friends. For larger groups, our head chef has designed a special menu which, just like our regular menu, combines Swedish home cooking and classic cuisine from the Mediterrannean. In our Chambré Séparée, our guests are offered a dinner in a peaceful and exclusive environment with its own bar, private entrance, private bathroom restroom facilities and a small stage for any speech or other entertainment. To get the most out of your experience, we recommend booking our Chambré Séparée at least two weeks in advance. The name Kopparkitteln (the Copper Kettle) comes from the old housing association called Koppardosan (The Copper Box). It all started with the town alderman Carl-Gustav Björkman, who built a two-storey building to set up a shop. The property was later bought up and a pharmacy was set up in the premises. 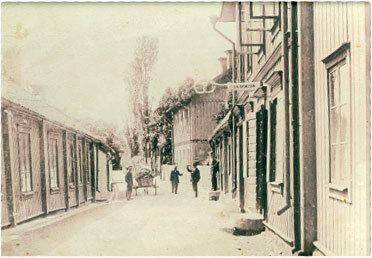 Due to poor profitability in the contemporary small-town pharmacies (Sigtuna had only 300 inhabitants at this time), a so called ”Stadskällare” was established in the cellar, which is a nickname for the most exclusive tavern in town. The pharmacy was moved in the mid-1800s, while the tavern remained with Arvid Granström as a new restaurateur. In 1918, the whole inclosure was bought by Olof Palme (uncle of our late Prime Minister Olof Palme). Olof Palme (Sr.) died in the Finnish Winter War and left his widow behind with five children and the whole property. When the widow Palme sold the property, a confectionary was established in the building. In 1939, the whole building burned down in a landscaped arson. The tenant of the confecionary, direcor Schwieler, was later sentenced to a long imprisonment for arson toghether with his wife. The property was later renovated and the confecionary continued until the 1970s, and is said to have been our king His Royal Majesty Carl-Gustav Bernadotte’s favourite whereabout during his years at SSHL, the royal boarding school in Sigtuna. Since the 1980s, a restaurant has been runned in the building. We recommend that you book a table prior to visiting Kopparkitteln. It is possible to make reservations for eight people online. If your company is bigger than eight people you can call or e-mail us and we will take care of it.